Every year there are F1 cars that don't score any points and always qualify at the back of the grid. It's a fact of life. For the past few years those cars have been run by HRT, Marussia, and Caterham. Now that HRT has gone out of business, presumably from being so gosh darn slow, there are only two backmarker teams left in the series. And of course, both are promising massive steps forward in performance for 2013 thanks to aggressive designs and talented personnel. Backmarker teams make this sort of promise all the time. They've hired some behind the scenes rockstars that are supposed to totally transform the way the cars perform. HRT had Geoff Willis on staff for the design of their last car. Willis was a prominent and successful member of BAR-Honda, Honda Racing, and Red Bull before working at HRT. And HRT still finished dead last. 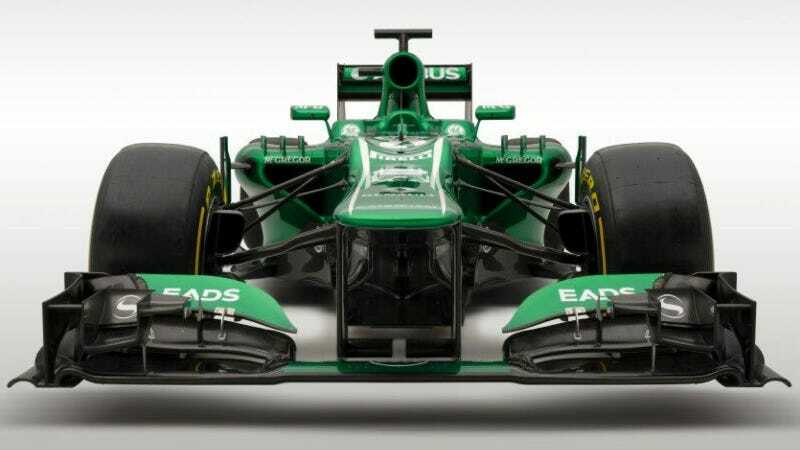 Caterham's new car is the CT03. The car is powered by Renault's RS27 V8 and designed by Mark Smith, who used to be with world champions Red Bull Racing and also worked with Force India. The CT03 has a number of cool little details like an aggressively stepped nose and turning vanes on top of the side pods. It's quite the attractive car. Of course, good looks don't immediately transfer to speed. The Marussia MR02 is the first car from the team designed by Pat Symonds. If that name sounds familiar, it's because he played a major role in the scandal where Nelson Piquet Jr. was ordered to crash in Singapore in order to allow Fernando Alonso to win the race. He was subsequently banned from the sport, but now he's been allowed back in. The MR02 is the first Marussia to be in a windtunnel (Correction: Last year's car, the MR01 also spent a little time in a windtunnel. Apologies) and uses a KERS power boost system sourced from the Williams team. But both cars will still be very close to the back of the grid all year. And that's because these teams might have corporate sponsors, but they don't get a huge investment or have massive budgets. Both teams have pay drivers to help add to the bottom line, but that isn't really enough to keep up with Ferrari or McLaren's bottomless pockets, top quality drivers, and amazing engineering staff. Cars hit the track for testing in Jerez, Spain this week. It'll be interesting to see just how big a step forward Caterham and Marussia have made.